The Quintet is happy to be premiering Procesión jíbara by Edgar Colón-Hernández on our concert December 15, 2008. The Quintet's association with Edgar goes back to the 1980's when Edgar was writing the program notes for the Quintet's Columbia Artists tours. Matt and Barbara worked with Edgar again when they performed with the Gay Men's Chorus. It was there that Barbara heard Edgar's compositions and asked him to write this piece for the Quintet. Born in Puerto Rico, Edgar Colón-Hernández studied at the Escuela Libre de Música, the Pablo Casals Conservatory in San Juan, Puerto Rico, and the University of Puerto Rico. He completed his BA in Music History at Hunter College in New York City. An avid and prolific choral singer since childhood and an amateur performer of Early Music and contemporary music most of his adult life, Mr. Colón-Hernández was co-founder of The Monteverdi Trio and Cygnus, a vocal quintet. Edgar is a proud charter member of the New York City Gay Men's Chorus, entering his 28th season with the chorus, having twice served on its Board of Directors, and sharing responsibilities as Assistant Director from 1987 to 1994 with the late Dean X Johnson. 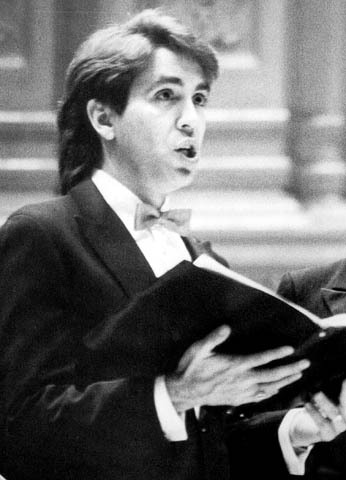 His works and arrangements have been performed by the NYCGMC and its Chamber Choir, the Cincinnati Men's Chorus, Denver Gay Men's Chorus, Windy City Gay Men's Chorus,the Monteverdi Trio and the Salomone Trio, as well as many other choruses and vocal ensembles. Until recently, he was the Program Department Director at Columbia Artists Management, Inc, in charge of writing program notes for the many international orchestras, ensembles and soloists managed by the company. He is an HIV+, disabled person living in New York City.